Credit: W.I. Castle / Canada. Dept. of National Defence / Library and Archives Canada / PA-000969. 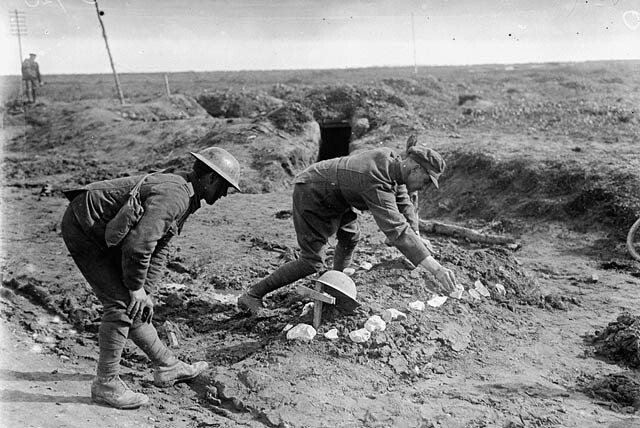 “During the war certain authorized sites were selected, some close to the trenches, where the dead could be buried, and the soldiers were promised that, if they brought back their dead comrades to these, which they not infrequently did at the risk of their lives, they would rest there permanently undisturbed. This promise has been kept in all cases, except a few where the site originally selected has been found altogether unsuitable.” (Ward, Gibson, Courage Remembered, p. 49-50). During our Vimy Pilgrimage Award program, great distances are covered in the effort to allow each student to visit the grave of a soldier they have researched. The 2018 Vimy Pilgrimage Award is made possible by the sponsorship of Scotiabank, and by the continued support of Canada’s History.